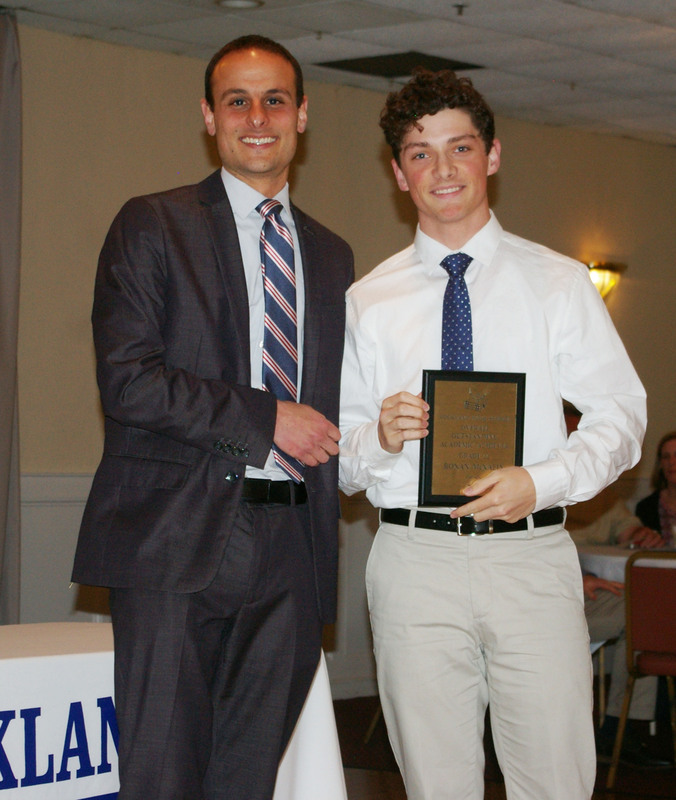 Dr. Harrison presented Ronan McNally with the prestigious Overall Academic Achievement Award for Grade 11 at the Academic Awards Banquet on June 9. As the end of the year drew closer for seniors, so did Principal John Harrison’s first year at Rockland High School. Mr. Harrison shared his opinions on his first year, stating that it has been very “enjoyable” as he got the “opportunity to get to know the students and staff [of Rockland High].” He also said that he is trying to learn more about RHS, and that there is always room for improvement. Math teacher Kathy-Anne Hoffman said that Mr. Harrison performed exceptionally as his first year as Rockland High’s principal. Stuzziery says that Mr. Harrison made an effort to attend every activity Rockland High School hosted which is important to all the students in the different activities offered by the school. During his first year, Mr. Harrison didn’t propose too many changes. However, among the things he did change, he added a new aspect to Graduation, which included reading senior bios (their name and what they plan to do after high school). Another new thing he has put in place is offering new electives and half-year studies for freshmen. He also reintroduced a few programs, including the assembly for Chris Herren. Furthermore, he brought studies back for sophomores. He said a program he would like to add in the future is a robotics club. As principal, Mr. Harrison says he has some specific goals. They include getting smaller class sizes in core academic classes, embedding more PSAT and SAT questions into class lessons, finding new ways to recognize students for what they do, whether a small achievement or big accomplishment, and implementing a new safety practice known as ALICE. This new safety practice will allow students and staff to safely and correctly respond to area shootings (in this case, school shootings; for more information, visit https://www.alicetraining.com/ ). Mrs. Hoffman feels the environment of the school has already been transformed into a more positive environment which is another of Mr. Harrison’s goals. She said that Mr. Harrison is “stressing the significance of academics, and holding both students and teachers accountable” for effective teaching and learning. Mrs. Hoffman also discovered that Mr. Harrison was once a statistics teacher, which at first, she says, was intimidating for her since she teaches this class. That said, she likes how some parts of his mathematical background show through in his work. “[He is] very organized, [and] his approach to problems is very methodical; he is very analytical and detail-oriented,” she says. Another trait she likes about him is that he can always be seen around the school. Of note is that Mr. Harrison is now Dr. Harrison, having completed his doctoral program in education at Northeastern University. But in humble fashion, he says he prefers to continue to be called Mr. Harrison by students and staff. Being totally new to Rockland High School, Mr. Harrison has a genuine interest in learning about who each student is. He found that the effective method to that is going to events, and referencing the Student At a Glance Book, a photo book of all the students at Rockland High that he received from Hockmeyer Studios Inc. (the organization which does the school pictures). Struzziery who is going into his senior year, says he expects Mr. Harrison will have another great year. He feels like he’s really gotten to know Mr. Harrison, and Mr. Harrison has gotten to know the students as well. One trait he likes about Mr. Harrison is his enthusiasm. “He’s approachable, and a really cool guy,” Struzziery added. With Mr. Harrison’s first year being well-received in the high school, rising seniors, juniors and sophomores are looking forward to his second year.